The club was formed over ten years ago following bad press of a few youths getting all youths tarred with the same brush! We operate on a shoestring, from the Barn on the Wharf between Homebase and Sainsburys. The club runs on a Thursday evening, the first week after the clocks go forward to the last Thursday in September. We start about 17:15 and run until 19:30 or when dusk draws in. We encourage the young people to work toward a B.C.U. Award. We can also offer those students participating in the Duke of Edinburgh award their physical activity and expedition section qualification. 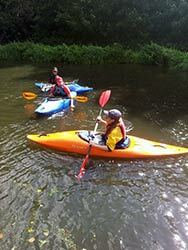 Trips are organised and run at weekends to other rivers and we also run canoe camping trips to other rivers as well. 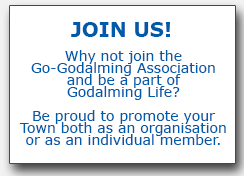 We have been involved with the Godalming Town Staycation event running, try sessions and canoe courses during the summer holidays along with assisting other groups who wish to bring their clients along to try the sport. It was agreed parents can take part in the trips as a family, but due to our insurance only covering the young people they would have to sign a disclaimer.